The Pratt-Whitney PT6A is a popular engine for maintenance training. Its operation is simple and easy to explain. The engine utilizes two independent turbines, one driving a compressor in the gas generator section, the second driving reduction gearing for the propeller.AeroTrain Model AE-07 is a PT6A-20 cutaway mounted on a roll-around stand. The machined cutaway shows the internal stages of the engine. Cutaway coloring scheme provides easy identification of engine sections. 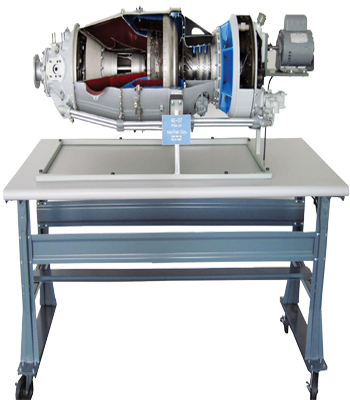 The Model AE-07 is powered by a free turning AC motor to demonstrate the phased operation of compressor and turbine. Take-off: This rating is the maximum power permissible and corresponds to 550 SHP at sea level up to 21 degrees C ambient temperature. The maximum allowable output torque must not be exceeded. Maximum Continuous: This rating corresponds to 550 SHP up to 21 degrees C ambient temperature, sea level, static conditions. It is intended for emergency use only. Maximum Climb: This rating corresponds to 538 SHP at sea level, standard day (15 degrees C ambient temperature) and is the maximum power approval for normal climb. Maximum Cruise: This is the maximum approved power for cruising and is 495 SHP at sea level, standard day.